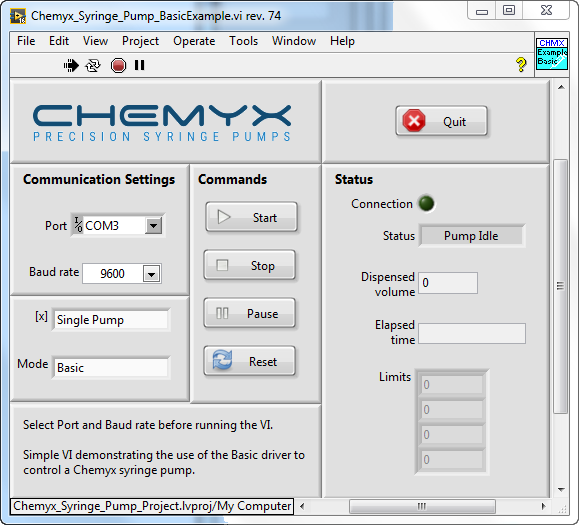 The Basic.vi shown here allows for easy pump operation. You can set the port and baud rate in the ‘Communication Settings’ area. Then you can click start to start the motor, stop to stop the motor, pause to pause the motor, and reset to restart the motor. While the motor is running the status indicators will show current information. Connection shows if you are connected to the pump. Dispensed volume shows the amount of volume the syringe infused. Elapsed time shows the time the syringe has been running, and limits shows the rate and volume limits of the syringe pump.